Even if you are not directly interested in physically massaging people, Intuitive Massage is an excellent way to make contact with or strengthen your sixth sense instinct or "gut feeling" about how to relate to others. A strong and clear intuition is a vital life skill with applications in business and social relationships. Our gut feelings provide guidance on how best to navigate tricky situations and difficult people as well as how to flow harmoniously, intimately and co-creatively in close loving, or work and team, relationship situations. As we come under stress we go into one of our stress sub-personality patterns and quickly lose flexibility and openness, including the ability to receive subtle information and clues from other people, from within ourselves and from our surroundings. One of the valuable human resources that we lose access to under stress, is our deep inner sense of wise guidance. Under stress it is so easy for frustration, anger, fear or desperation to drive our words and actions. Sensible reasoning and calm intuition are "out the window". Intuitive Massage training is a stress prevention and personal social skill development system which also has applications in relieving stress - both giving and receiving Intuitive Massage can be profoundly stress relieving. Many massage therapists find themselves tired, "drained of energy" or even "toxic" at the end of a day's work. The Intuitive approach is both a preventative style of massage and also an antidote for "massage fatigue". Intuitive Massage can be used on it's own or in combination with structured systems of massage such as Aromatherapy or Swedish massage. 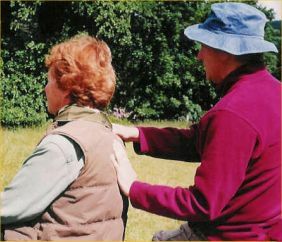 The meditative massage technique taught on our course was originally developed at the Esalen Institute in California and has since spread around the world. The intuitive massage system is applicable to any area of the body and can even be used for self-massage or for massaging animals. The style of massage we teach on this course is called Sunflower Intuitive Massage - a combination of breathing, massage and meditation that you can do on yourself, with a partner, or even with a pet dog or cat. Dr. Meredith explains "I developed the Sunflower Intuitive Massage system over a period of 10 years after being disappointed with the slowness of achieving results using meditation alone for achieving that state of inner calm and centredness where we can rest, heal and make better decisions. The beauty of this massage is that anyone can do it anywhere, at any time. Connecting harmoniously and with unconditional love to another human being is a wonderful, powerful enhancement of a personal meditative experience". The Sunflower Intuitive massage is a centring and relaxing experience for both the giver and the recipient but above all it is a magical experience in which every massage becomes a mysterious and amazing journey! Spiritual people often experience intuitive massage as a sacred massage - a receiving of divine guidance. This short course is suitable for beginners as well as experienced massage practitioners. There is no need to remove any clothes and you do not need to bring a partner - we will provide one. For uncovered areas such as the hands you can choose to use massage oil, baby gel, powder or just direct skin contact. If you have a favourite aromatherapy oil or massage gel feel free to bring it along. The workshop tutor Dr. Mike Meredith is a trained physiologist who also holds a PhD in anatomy. He first learned the intuitive style from a Buddhist monk who had trained at the Esalen Institute which gave birth to the modern art of Intuitive Massage. Mike then used his experience as a professional trainer to develop a simple and enjoyable way of teaching it to beginners and applied his training in physiology to enhance the power and range of the massage.